A half-century after the “War on Poverty” of Lyndon Johnson, poverty rates remain unchanged. Scholars have advanced polarized theories about the causes of poverty, as politicians have debated how (or if) to fund welfare programs. Yet little research has been conducted where the poor are provided a platform to speak on their own behalf. While it is important to understand how economic systems affect the homeless, it is equally important to learn about the day-to-day realities faced by those who rely on public policies for survival. Over the course of 10 years, Dr. Phillips has worked with numerous homeless communities, including communities in Camden, NJ, central Michigan, and southern Illinois. Drawing on the author’s experience working in homeless communities, this research presents some of the stories of loss, abuse, addiction, and marginalization through interviews, observations, and ethnographic research. Joshua D. Phillips, Ph.D., is an instructor in the Department of Communication Arts and Sciences at Pennsylvania State University, Brandywine. His scholarly interests are in rhetoric, narrative, and intercultural communication with specific focus on issues of homelessness, poverty, welfare, race, and sexual violence. His new book, Homeless: Narratives from the Streets, recounts stories of homelessness in an effort to improve public policy. Page last updated by CURE at 9:21 am April 4, 2017 . 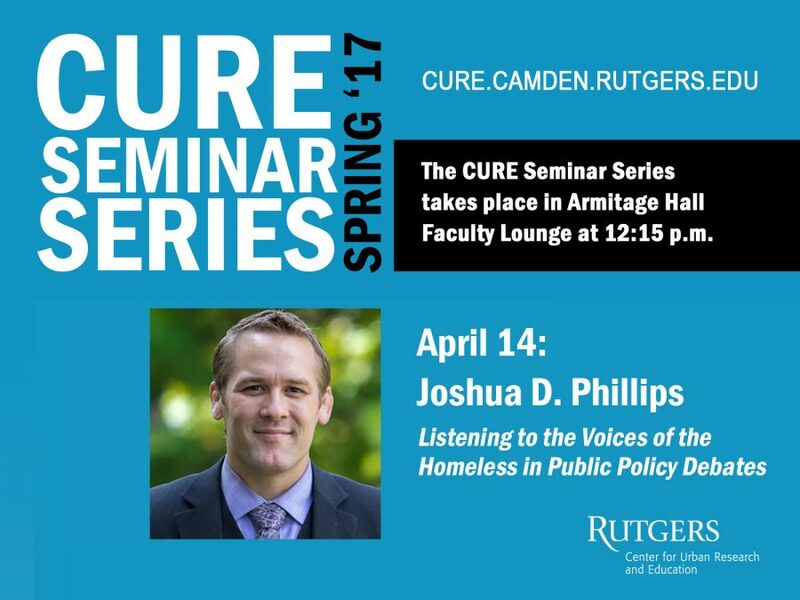 This page was printed from http://cure.camden.rutgers.edu/events/cure-seminar-series-joshua-d-philips-listening-to-the-voices-of-the-homeless-in-public-policy-debates/ at 8:49 AM Saturday, April 20, 2019.